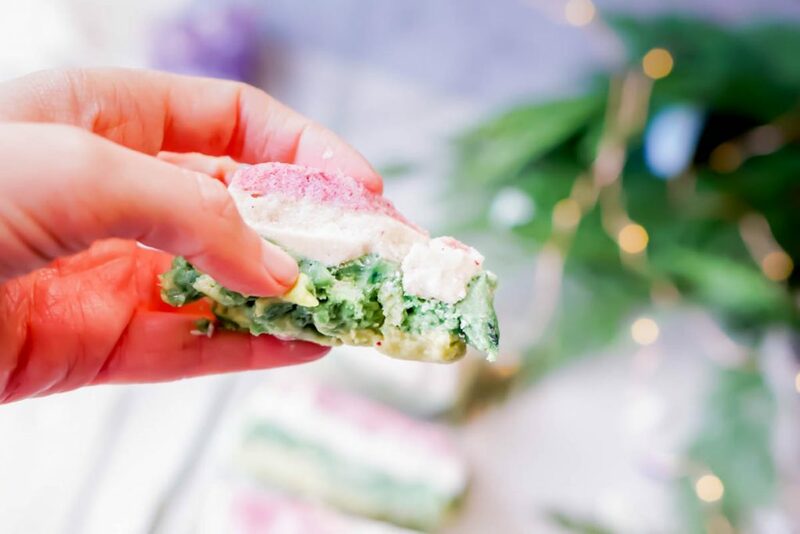 We have 3 days away from Christmas and I am SO excited to share this completely sugar-free recipe. It’s super duper easy to make and the most beautiful when it’s completed. 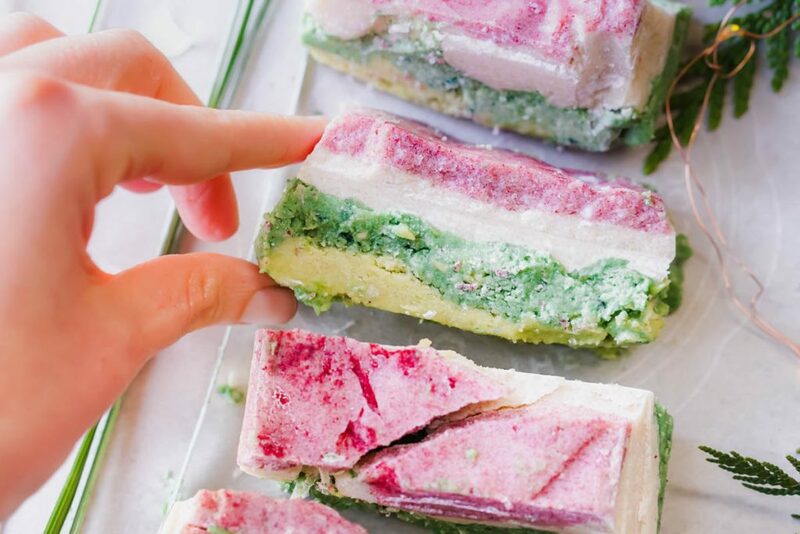 You can keep this in your freezer or fridge to munch on or bring it out for the parties. 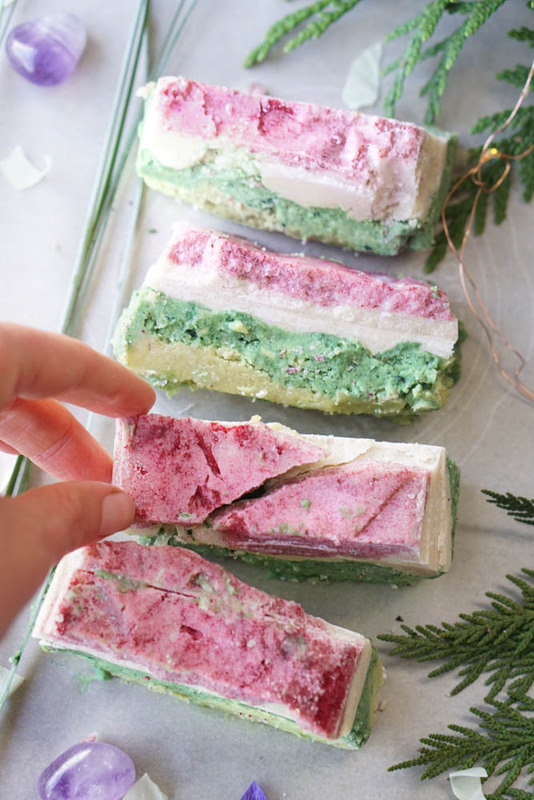 The colorful layers of the magical Christmas fudge make it absolutely stunning for everyone involved. 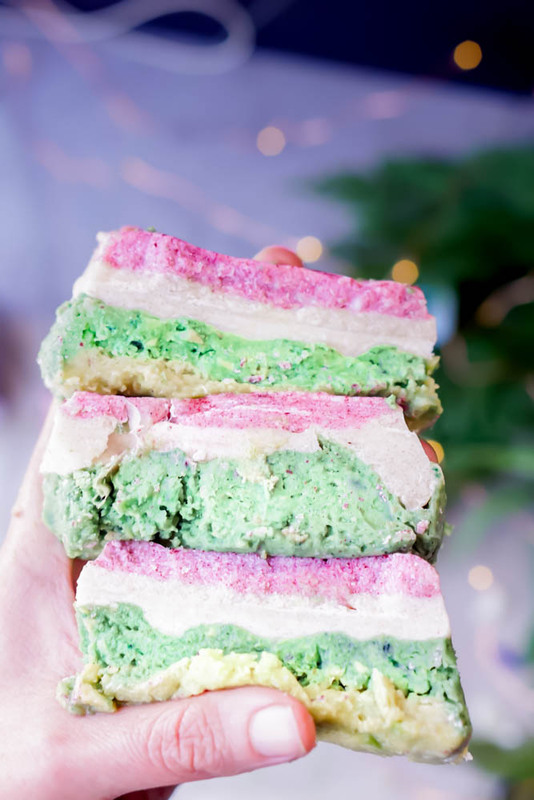 Magical Christmas Fudge is made of three different layers, and completely naturally colored which means no artificial coloring for you or loved ones. I always get the most excited about bright and beautiful treats. I made this layer with coconut oil, raw monk fruit, vanilla bean powder, coconut butter and the superstar of the show is organic cranberry powder from Mountain Rose Herbs. White coconut layer consists of coconut butter, coconut oil, vanilla creme stevia, 3 drops of peppermint oil, and raw monk fruit. With an adaptogen option from Sun Potion using Yin Power. Minty Green Layer has the superstar in the green layer which is the e3live spirulina, with avocado, raw monk fruit, coconut oil, and stevia. Benefits of spirulina other than the beautiful natural coloring and superpowers. e3live gives you the brainpower basically to help send oxygen to your brain and act as a natural adaptogen for stress and life on a daily basis. There is SO many benefits to look into besides how vibrant green it is. Like mentioned if you are strong on time feel free to just make one of the layers into a bark or cut the recipe in half if it’s too rich for you. I recommend making the huge batches for you to store in the fridge and eat small pieces when you are craving something sweet. *If you are on Body Ecology or the early stages of your Candida protocol the cranberry and avocado layer will be friendly for you. The white coconut layer could be in small doses but that is for you to listen to your body. for each layer it will be the same step, to place all the ingredients into your food processor and blend until smooth and pour into your container. I use a 3 x 5inch glass container with a lid on it and lined it with parchment paper. layer the green layer first place into freezer while you make the white layer, make the white layer and pour into the glass container and blend your cranberry frosting and pour on the top layer. Make sure to rinse your food processor out in between blends if you want your layers to be a distinct and solid color.